During the week of January 16-19th, I visited the Smithsonian Tropical Research Institute (STRI) to discuss several matters relating to the Smithsonian Research Online (SRO) program and to offer technical support and training to STRI library staff. I was accompanied from Washington by Digital Services Head, Martin Kalfatovic, who was to attend a three-day Encyclopedia-of-Life meeting at Barro-Colorado Island during the same week. Together we met with Oris Sanjur (STRI Associate Director for Science Administration), Vielka Chang-Yau (STRI head librarian), Angel Aguirre (librarian), Klaus Winter (STRI scientist) and Eldredge Bermingham (STRI Director). Everyone was in agreement that STRI-authored publication data ought to be collected in one place and that the SIL is doing a good job of coordinating this program across all Institution units. The Director and Associate Director will discuss the specific needs of their unit and report back to SIL, who will propose a workflow to accomplish this. Meanwhile, I held a brief introduction to the bibliographic tools, EndNote and Zotero for STRI library staff and volunteers. While we had a training room available to us, unfortunately there was not a copy of these programs available to all participants. But they were still able to see the possibilities of using these tools in day-to-day library services. 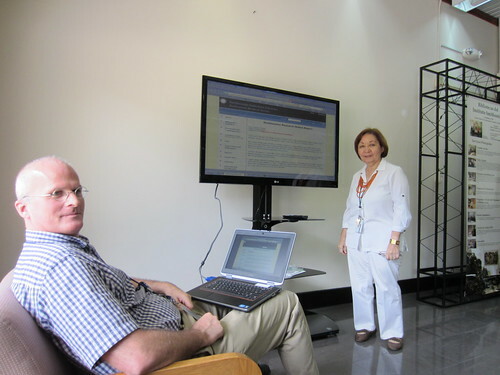 Alvin and Vielka review the SRO website and list of Smithsonian-authored publications using the newly-installed LCD screen in the STRI library. Photo courtesy of martin_kalfatovic via Flickr. Finally, I met with Fernando Bouché (Head, Office of Information Technology) and STRI programmer, Carlos Caballero, to discuss the management of publication data, its re-use on the STRI web page and inclusion in the SI Collections search system (EDAN). STRI scientists publish over 300 scholarly papers every year. Approximately 70% of them are captured automatically by the SRO via websites and associated tools. This circumvents the need for manual data entry. The inclusion of the complete corpus of work being done there is an essential part of representing the research being conducted at the Institution and the cooperation between the SI Libraries and STRI will bring the project to fruition. Next Post Seeking Applications for 2013 Dibner and Baird Resident Scholars! The Smithsonian tropical research institute library is like a treasure island, there are so many interesting books you can find that cannot be accessed any other way. Each time I have the opportunity to go there, I visit it.